No longer do students have to try to memorize long boring vocabulary lists by using archaic rote memory techniques. Vocabulary Cartoons makes learning vocabulary fun and easy by using brain-friendly memory aids in the form of visual and rhyming mnemonics. A mnemonic is a device used to improve memory. It helps you remember something by associating it with something you already know. Mnemonic devices have been used in many forms including keywords, acronyms, rhymes, poems, songs and visual aids. For example, you may remember this mnemonic from grade school, "Columbus sailed the ocean blue in fourteen hundred ninety-two." This helps you remember when Chistopher Columbus discovered America. Vocabulary Cartoons incorporates a visual and rhyming mnemonic for every vocabulary word. Students learned 72% more words with 90% retention in actual school tests. This book is a must for visual learners, ADD, ESE and all college bound students. Excellent teaching resource for improving standardized test scores like the common core, SAT, and ACT. 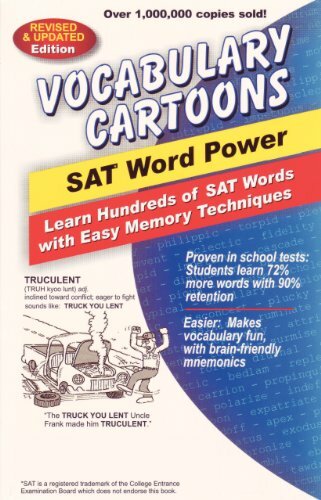 All 290 words found in this book are taken from SAT and ACT word lists and after every ten words there is a matching and fill-in-the-blank review quiz. Recommended for 7th - 12th grade students.